Lupin the Third, The Hell Are You Doing with That Car? Lupin from Japanese anime Lupin the Third drives a Fiat 500 in the classic flick Lupin the Third: Castle of Cagliostro. The car is very much part of the character's lore. No wonder Fiat launched a special limited edition Lupin Fiat 500 in 2008. That's easy to get your head around! This? Less so. Suzuki is launching a limited edition Swift dedicated to everybody's favorite crook. The car, which will be sold in Italy, comes in either a 4-cylinder, 1.2-liter engine or a 1.3-liter turbo diesel. 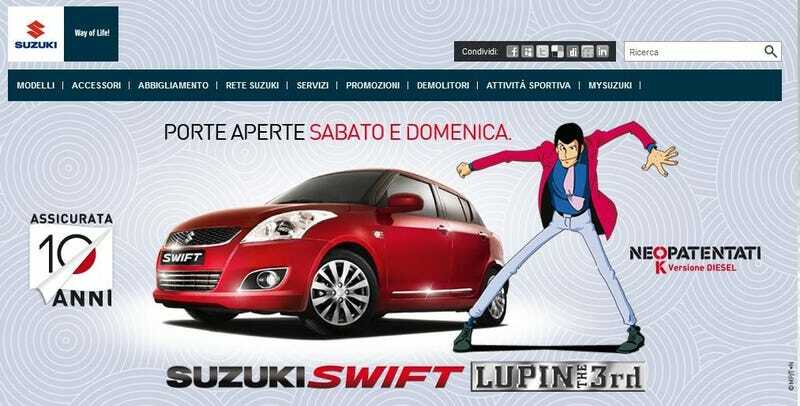 But Lupin has nothing to do with the Suzuki Swift! He's simply tacked on to sell this car. There's nothing special about this special edition. The car also has a ten-year insurance policy to protect against theft, robbery, and fire. That all sounds rather sensible for something the world's greatest thief to stick his name on.